The NOW function in Excel is a formula that displays the current date and time. It is automatically refreshed anytime the workbook is opened or a change is made. It can also be manually refreshed by pressing F9. To learn more, launch our free Excel crash course now! Please note, you must include the parentheses and do not type anything between them. Here is a screenshot of the Now function in Excel at the current time and date. As you see in the example above, the formula is simply equal to =NOW() and the date, as well as the time, are automatically displayed in the cell. 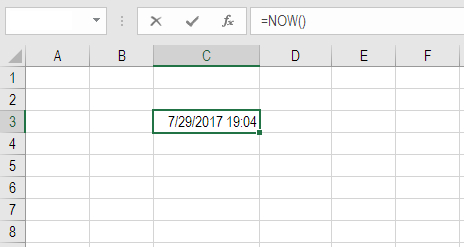 The TODAY function is similar to the NOW function in Excel in that it displays the current date, but it doesn’t include the time. Why use the NOW function in Excel? This function can be very useful for spreadsheets that require printing, and where a time stamp on that printout would be helpful. Another reason would be to clock in and clock out. If you setup a table, you can copy and paste as values the time when you start, and then copy and paste as values the time when you stop. This way, you can easily keep track of the exact time. The NOW function will not update for any other reason, so be careful when you’re looking at the time to make sure you press F9 or change a cell to refresh the values. Today() function in ExcelToday's DateExcel today's date formula inserts today's date in a cell. It can be very useful to have Excel display today's date when performing financial analysis. This little-known function allows you to insert today’s date easily into any cell in the spreadsheet.